Ahead of Patch Tuesday, Microsoft today released cumulative update KB4490481 for Windows 10 1809 aka “October 2018 Update”. It includes a lengthy list of fixes and improvements. We’re just a week away from Microsoft’s traditional “Patch Tuesday”. It’s where, on the second Tuesday of the month, the company releases updates for all supported versions of Windows. 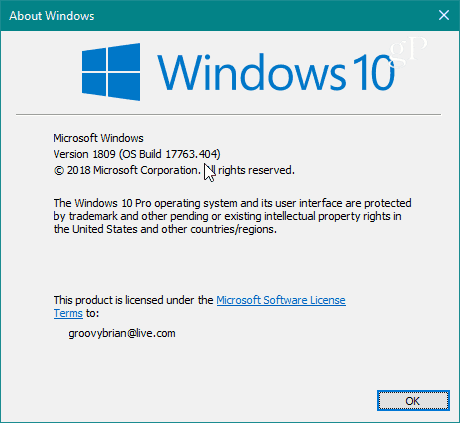 However, Microsoft today released a new cumulative update in the form of KB4490481 for Windows 10 1809 aka “October 2018 Update”. There are no new features to report, but there is a long list of under-the-hood fixes and improvements for 1809. It includes fixes to audio devices, Microsoft Edge, graphics, USB cameras, and a lot more. Addresses an issue that prevents users from enabling gan-nen support for the Japanese Era. For more information, seeKB4469068. You will get the update automatically in the background in the next couple of days. Or, if you want to stay on top of things, head to Settings > Update & security > Windows Update > Check for Updates. Or, you can manually download and install KB449081 from Microsoft Catalog. After installing the update, your build will be bumped to 17763.404. You can check that by hitting the Windows key and type: winver and hit Enter. Note that there are a few known issues with this update and it’s important to check Microsoft’s full blog post for all fixes, known issues, and workarounds.